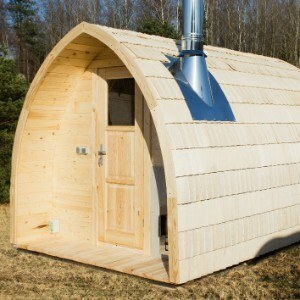 We Offer High Quality Outdoor Saunas From Lithuania At An Affordable Price! 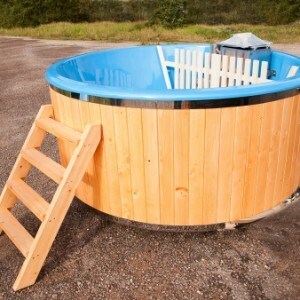 We Also Manufacture Wooden Hot Tubs, available with plastic or firberglass frame for sale! Outdoor sauna is a great choice for your garden or backyard, the exterior is made of high-quality wood, so it has an aesthetic, natural appearance. 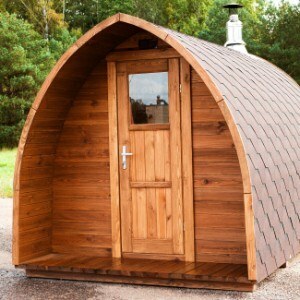 Garden saunas can be classified by shape - barrel saunas (round), sauna pods (triangle shaped), and square. 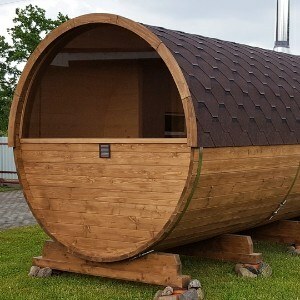 Most popular are barrel saunas, because of their unique look and affordable price. 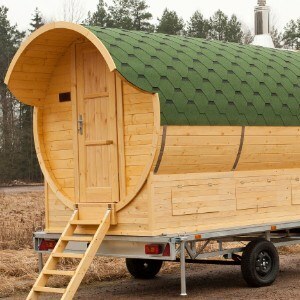 This POD sauna is made from the thermowood, it gives her amazing look from the outside! 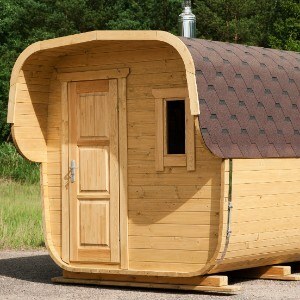 The interior of the sauna is also made from the thermowood, that's why this model is called royal! 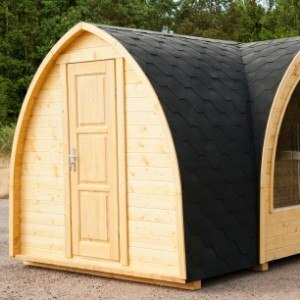 This "POD sauna" model has an aesthetic appearance and decent price. 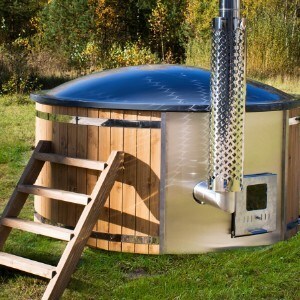 The total length of this model is 3,5m, it heats up pretty fast (about 1 hour) with standard wood-burning stove. 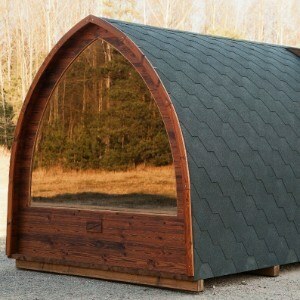 On the other hand, this model is 2,4m wide, so it is spacious inside! The wood-fired hot tub is also a great choice for your garden, backyard or terrace, can be used along with an outdoor sauna. The inner frame made from high-quality fiberglass and exterior part is decorated with wooden panels. 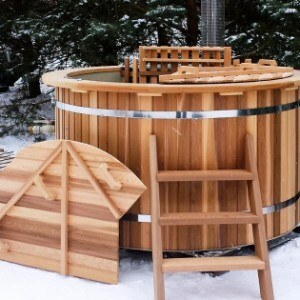 The hot tub is suitable for winter use, so you can have a warm bath outside on a cold & snowy day, and have a wonderful experience, beneficial for your overall health. 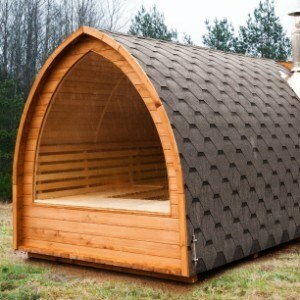 This POD sauna has an exclusive design, roof covered with wooden shingles gives her that smooth and unique look. Also, this POD sauna is designed with an extraordinary interior, benches with soft edges fit perfectly along with the panoramic window. We ship our products through all the Europe including Great Britain and Scandinavia. We also ship to the United States, Canada, and other non-EU countries... Contact us for more details about the delivery process! We do our best to provide discounts on the most demanded wooden products by our clients. 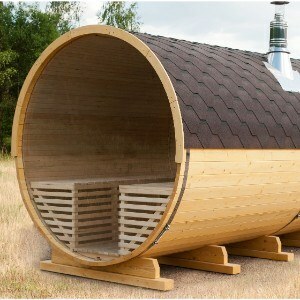 Outdoor saunas and expensive hot tubs come up with some special gifts inside for better use! 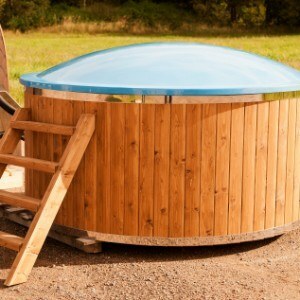 To manufacture our products (outdoor hot-tubs and garden saunas) we use only high-quality materials. Accessories, such as heaters, stoves, frames etc. are made by local manufacturers, to bring the best quality for a good price. We promise to respond to your email in under 48 hours. We also communicate with our clients since the day we get the product ordered, till the day when the customer gets it successfully delivered. How to maintain the outdoor sauna? 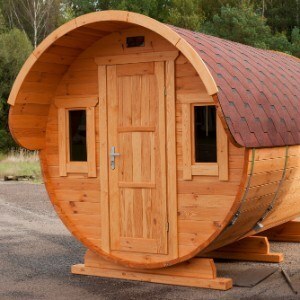 We manufacture wooden products - outdoor saunas, barrel saunas, pod saunas, square saunas and hot tubs for sale. Our company is based in Lithuania, but we can transport our wooden products to many coutries, fully assembled or flat-packed. Watch video how our products are being made in a workshop. to UK (England and Ireland), Canada, USA, France, Germany, Norway, Sweden, Finland, Denmark, Italy, Spain, Holland, and Austria!